M/V Acacia has 16 cabins. All of them have King size beds, bedside tables, air conditioning (in rooms and all indoor areas), mirrors, fine pillows, sheets and blankets (100% Peruvian pima cotton, 400 thread count), 100% organic bathroom accessories, finest quality bathrobes and towels, electric current for 110/220 volts, shower, hot water, safe deposit boxes and minibar. 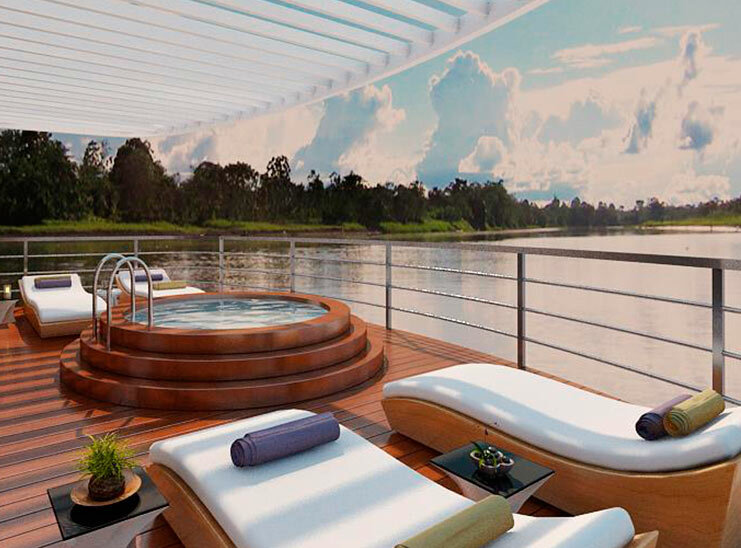 Let’s cruise the Amazon Jungle on board the Acacia! 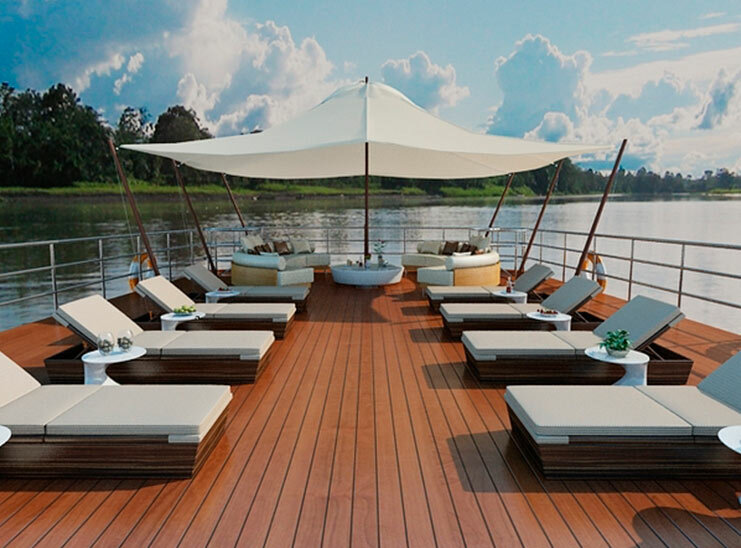 All about the Acacia Amazon River Cruise. 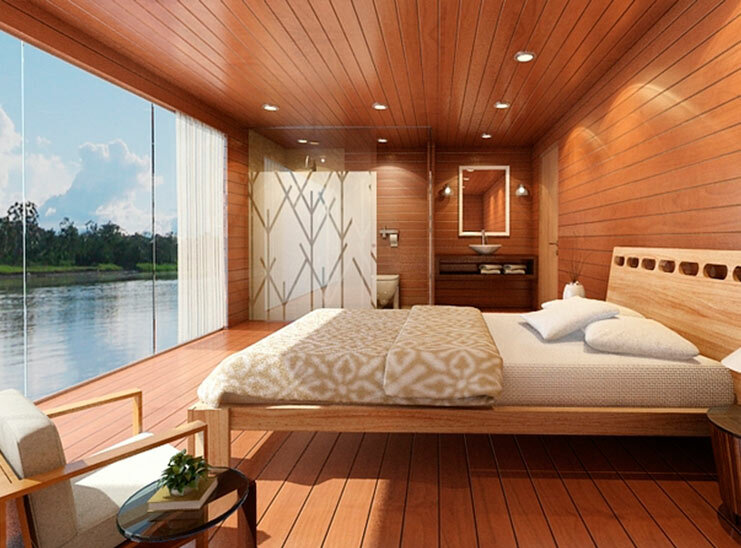 M/V Acacia has 1 Master Suite. With a Super King Size Bed, bedside tables, air conditioning, mirrors, fine pillows, sheets and blankets (100% Peruvian pima cotton, 400 thread count), 100% organic bathroom accessories, finest quality bathrobes and towels, electric current for 110/220 volts, shower, hot water, safe deposit boxes and minibar. Day 1; Fly Lima to Iquitos on the afternoon flight. You will be greeted upon arrival and transported to the M/V Acacia by car/bus from the Airport to Nauta in 1 hour and 25 minutes ride. 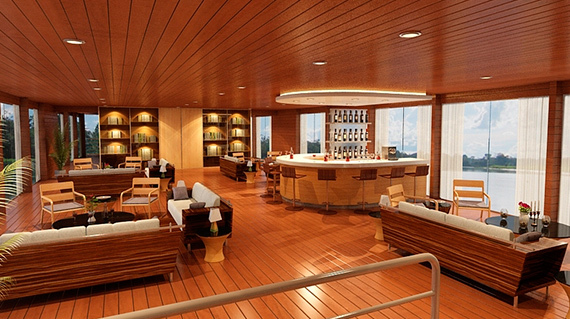 Upon arrival, take some time to settle in, relax and have a drink as you get to know your fellow passengers. There will never be more than 8 guests, so you will have the opportunity to make life-long friends. We will conduct a safety drill and explain everything you need to know about the M/V Acacia to have a safe and fun adventure. Savor the first of many wonderful dinners by our talented chef as we begin our journey along the Amazon. (Dinner). Day 2; Enjoy breakfast as we cruise along the Marañón River. Board our excursion boat for a day-long excursion in the Pacaya Samiria National Reserve, the largest reserve in Peru and the second largest in all the Amazon. Travel by excursion boat from Yanayacu Creek to the remote Yarina Cocha. We will take a rainforest hike and you will experience the huge biodiversity that the rainforest is known for. Watch for monkeys, sloths, tree-frogs, iguanas, pink and gray river dolphins, and many varieties of bird species. Examine and learn first-hand about jungle plants – their unique survival tactics as they compete for sun and nutrients in the dense rainforest, the part they play in sustaining the complex balance of life in the jungle and the important medicinal value they offer. After a day filled with once-in-a-lifetime experiences, return to the M/V Acacia for dinner and a relaxing evening with friends. (Breakfast, Lunch, Dinner). Day 3; In the morning we depart for our next adventure – a spectacular tour of the rainforest from its canopy. Take a short hike to the canopy walkway – a suspended bridge spanning over 500 meters (1/3 of a mile) connected by platforms in the rainforest treetops. Experience a unique view of the rainforest flora and fauna from heights reaching 35 meters (115 feet). After this breathtaking experience, enjoy lunch and some free time aboard the Acacia. In the afternoon we will visit one of the local villages to gain a deeper insight into how people live in Amazon. Meet a local shaman, participate in a traditional ceremony of spiritual healing. Before you depart, you will have the opportunity to view and purchase some of their handicrafts and delightful folk art. (Breakfast, Lunch, Dinner). Day 4; As we cruise slowly back down the Marañón River we will come to the confluence of the Marañón and Ucayali rivers, where the “true” Amazon River begins. After lunch transfer to the Iquitos airport or your hotel. (Breakfast, Lunch). End of program. Day 1 The Adventure Begins! Welcome to the Amazon! Reached only by airplane or boat, the bustling city of Iquitos is the 5th largest city in Peru and the beginning of your Amazon adventure! You will be met at the airport and comfortably transported 1 hour and 20 minutes by road to the town of Nauta. 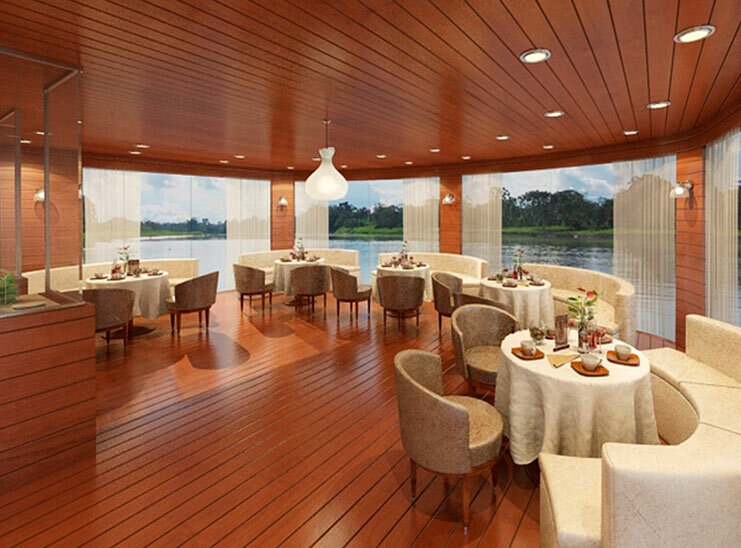 Here you will embark our modern and newly built riverboat, the M/V Acacia. Take some time to settle in, relax and have a drink as you get to know your fellow passengers. There will never be more than 8 guests, so you will have the opportunity to make life-long friends. As safety is our priority, we will conduct a safety drill and explain everything you need to know about the M/V Acacia to have a safe and exhilarating adventure. Savor the first of many authentic freshly prepared dinners by our talented chef as we begin our journey along the Amazon! (Dinner). Day 2 Ucayali River and Pacaya-Samiria National Reserve; After a relaxing breakfast, we will explore a small tributary of the Ucayali River looking for a variety of primates, colorful and unusual birds unique to the Amazon River basin and a wide variety of primates, mammals, reptiles, amphibians and rainforest plants. You will fish your own Piranha and some other species of fish. Our wildlife sightings and experiences will swell as we continue up river into the Pacaya-Samiria reserve, the largest wetland reserve in the world and home to over 500 species of birds, over 130 species of reptiles and amphibians and hundreds of mammals and primates. Have your binoculars and cameras on hand because our guides will expertly identify creatures difficult to spot with an untrained eye. After an invigorating day filled with once-in-a-lifetime experiences, return to relax in comfort aboard the M/V Acacia for a nourishing dinner and review of the day’s discoveries. (Breakfast, Lunch, Dinner). Day 3 Pacaya-Samiria National Reserve; Venturing deep into the rainforest, we will make a rainforest walk in Casual the wandering through the diverse attractions of a primary rainforest where the dense plant life is dramatically different than what we see from the river’s edge and harbors a whole new variety of exotic wildlife. As water levels allow, we will hike through the reserve for close up viewing and discovery lead by our expert and knowledgeable guides. Day 4 Pacaya-Samiria National Reserve; A pic nick breakfast will be serve in a remote area of the Reserve, we will further explore the vast wetlands of the Pacaya-Samiria Reserve. Add to your growing list of wildlife and bird sightings this morning. In the afternoon, we will visit a village along the river for a chance to meet and learn about the lives of the “Ribereño” people who call the river’s edge their home. It is an excellent opportunity to ask questions (practice you’re Spanish if you like!) and gain a deeper understanding of how people live in this remote part of the world. A wide variety of handmade handicrafts and delightful folk art will be available for your viewing and purchase. Experience paddling our Kayaks and know the jungle by yourself. Enjoy of many brilliant Amazon sunsets as we return to the M/V Acacia. As we cruise slowly back toward Nauta, join the crew and all your new friends in a farewell dinner of authentic Peruvian cuisine and a celebration of your Amazon experience. (Breakfast, Lunch, Dinner).